She dares not to bare. I known several human mothers who have experienced the “little nipper” problem to the point of misery, so I can only imagine the horror felt by vampire moms when the baby fangs arrive. Bottle feeding is the only practical solution in these cases. Just please, for the health of the baby, use real blood and not blood formula. Please don’t think I’m making light of a sensitive subject. Grinsane takes its responsibilities seriously not only as a source of quality horror comedy cartoons, but supernatural anthropology. You come here to laugh. You come here to learn. I hope you enjoyed this week’s double undeader of vampire comics. Check back next week for more strange toons! They refuse to fix the sheets in the coffin when they wake up, too. I’m not sure why children aren’t allowed to jump on beds in the absence of a trampoline (I wasn’t), but the universal ban on this thrilling activity apparently applies to the vampire world as well as the human one. Fortunately, unruly bed bouncing eventually runs its course when human children learn how to skateboard and vampire children learn how to transform into bats and fly. I’ve been having fun with this vampire mom character and her unruly pack of bloodsucking brats. She’s scheduled to make another appearance on Friday, so make sure to check back soon! Three day weekend, and summer is here… time to gather the family for a good old fashioned picnic. Yum! It’s been some time since we checked in with our resident zombie family, and here they are gathered at the park for a good old fashioned Memorial Day picnic (the last time we saw them, the children were playing telephone by using the Verizon salesman as a human fiber optic network). Seems like everywhere I go this week I’m seeing ads for grilling and barbecuing, but who needs a three hundred dollar grill to gather with the family and enjoy fresh meat outdoors? Certainly not these folks. This was one of the earliest cartoons I drew for Grinsane, but I’ve held off launching it until now since it seemed too summery to release in the grim of winter when I started creating these comics. During that time, I’ve actually reworked this one a couple of times to try and make the family consistent with my other zombie cartoons. Expect to see more of this intrepid band of corpses shambling through the pages of this comic. The ultimate dad, the father in this nuclear unit isn’t about to let a mere apocalypse break his family apart. Hopefully you too will be enjoying the holiday weekend with your own loved ones (in less morbid circumstances). I’m all alone this weekend (sniff) since my wife is out of town. I don’t think I’ll be seeing that new Star Wars movie with everyone else since I heard Ron Howard took it over and cut out all the sleazy scenes with the Wookers on Tatooine. So I guess it’s frozen pizza and war movies for me. Or maybe a zombie movie, perhaps? See you next week for another horror comedy comic from Grinsane! It’s fun to be a vampire. That’s the tagline from the Lost Boys, of course. And those bad boy bloodsuckers did have a rather fun life until Corey Feldman showed up on his bike with a backpack full of wooden stakes. I suspect the Martin Shkreli type with the vampire cure has more than just social harmony on his mind. He’s planning to make some bank with that new serum of his. In any case, he underestimated how eager his audience was to lose their fangs. The only bank he’ll be visiting tonight is the one at the hospital where they store the blood. If he makes it that far. And becomes one of them. Forget the vampire serum, next year at this time he’ll be presenting his research on vampire sunscreen so he can hang out by the pool during the conference. Thank you for reading Grinsane. Some freaky stuff is bubbling in the pot for next week. Visit again for more strange horror comedy cartoons! Well, it makes sense, doesn’t it? What goes in, must come out, and in the case of a vampire, it’s going to be crimson colored. Originally I wasn’t going to stick a caption on this cartoon. But then I started wondering, is it clear that “Vlad” is a vampire? 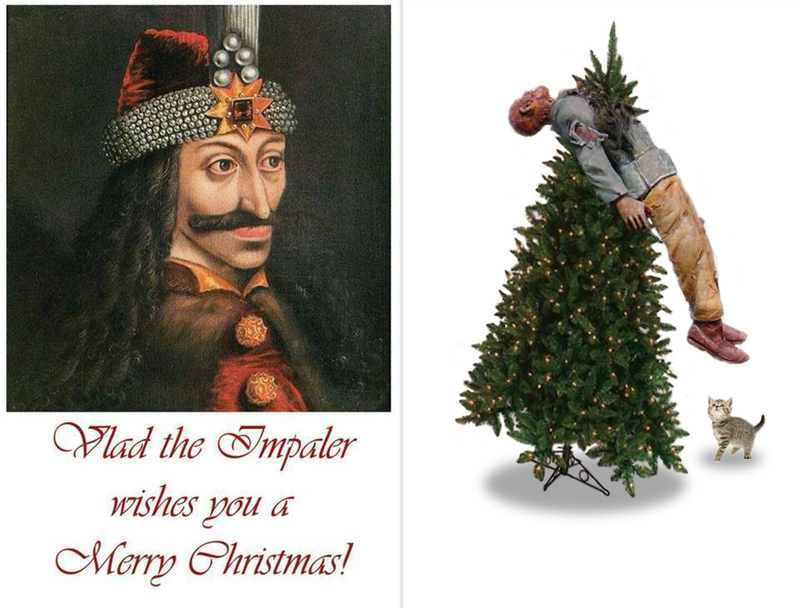 I was thinking of Vlad the Impaler when I drew the cartoon, but not everyone believes VTI was a real vampire, just a guy who liked to spike people for the holidays. Also, Vlad is a popular name in Eastern Europe. The guy in this cartoon might not be a vampire at all, just part of some Romanian fight club who’s kidneys took a pounding that night. And, of course, I wasn’t about to redraw the thing to say “Dracula” – that would have been silly and ruined the serious tone of what you see here. Vlad is a popular vampire name in any case. Vampire moms just love the name. Remember cute little “Laddie” from the Lost Boys? See, this cartoon doesn’t need a caption, just vampire literacy. It’s a very peaceful scene, in any case. As a cartoonist that struggles not only with recognition, but actual art, I’m quite pleased at the pleasant mood this one evokes. I can almost hear the soft patter of snowflakes touching the ground amongst the faint screams from the castle dungeon. So concludes Snow Week on Grinsane. Did you see the crazy snowman those creepy girls built on Tuesday? Check back next week for more strange and weird horror comedy cartoons!